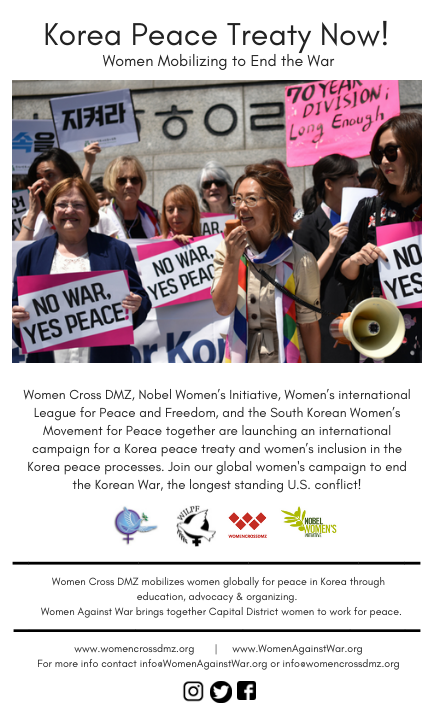 In May 2015, on the 70th anniversary of Korea’s division into two separate states by cold war powers, thirty international women peacemakers from around the world walked with thousands of Korean women, north and south, to call for an end to the Korean War, reunification of families and women’s leadership in the peace process. We held international peace symposiums in Pyongyang and Seoul where we listened to Korean women and shared our experiences and ideas of mobilizing women to bring an end to war and violent conflict. On May 24, International Women’s Day for Peace and Disarmament, we successfully crossed the 2-mile wide De-Militarized Zone (DMZ) that separates millions of Korean families as a symbolic act of peace. 4 Million people died in the Korean War of 1950–53, most of them Korean civilians. 10 Million families are still separated by the DMZ. 70 Million Koreans live in a state of war due to unresolved conflict. 60+ Years after the war ended with a temporary cease-fire agreement, we’re still waiting for a peace treaty. $1 Trillion is spent by USA, China, Russia, Japan, and South Korea on militarization, fueled by unresolved conflicts. Claremont, CALearn more. . .
Dallas, TXLearn more. . . Contribute to end the Korean War. Make a tax-deductible donation now to make a difference. Sign up for our email newsletter and receive updates about ongoing actions and upcoming events.